Making a return to TVB after 11 years, Michael Tong (唐文龍) portrayed the two-faced and cunning professor in Heart and Greed <溏心風暴3>. 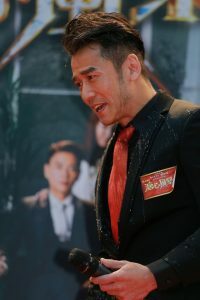 His affair with Sharon Chan (陳敏之) has been the most controversial talking point in the drama so far. Despite his deplorable role, Michael’s personal image has not been affected at all and the 48-year-old hunky actor saw a peak in his popularity. Michael, who actually holds a Master’s degree in Fashion Design, shows off his ability to act as the night school professor, Nic. Although seemingly harmless and professional at first, Nic is found to be a ruthless and scheming person whose ultimate goal was to woo his student, Sharon, in order to infiltrate her family business. Despite being married and has a six-year-old daughter, Nic tries all means to get close to Sharon, with whom he has an affair with in the series. The cast of Heart and Greed met with fans yesterday, trying to push up its mediocre ratings since the drama aired in November. Although Michael’s story arc has ended, he also made an appearance at the promotional event. And what happened to the cake? It was thrown at Sharon’s face. Both victims of pranks, Sharon and Michael laughed it off and understood that the antics were to generate a more lively atmosphere at the event and hopefully push up the struggling ratings. I have always like Michael Tong and his acting has improved after leaving TVB. I have no problems with artistes who play bad characters, after all, it is their job. But throwing milk tea and cake is bad. Not only is it as waste of food, it is disrespectful to do it to Michael and Sharon when they were not warned ahead. OMG… seriously? Throwing milk tea over an unsuspecting person in a public event is so degrading.. though it’s an act but that very moment, he must have felt mad and embarrassed. Can’t they do promos in a more respectful manner..? @cassiemissy I know, cheap promotional tactics. I would like WTF? ahaha LOL…. drenched in the show is degrading enough but on live event? sigh…. On a sidenote, I skipped here and there but totally gave up after epi 25 or so….. His role and the mistresses’ role was so hard to watch. 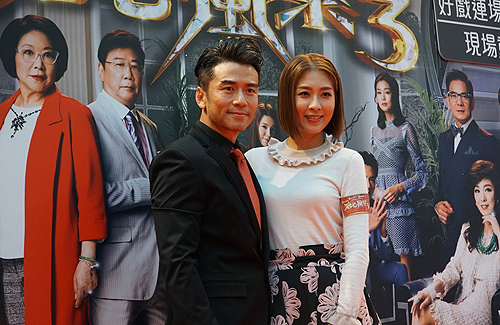 Sharon Chan’s role was also so cheap that it’s just shameful to watch. hahaa lol…. @cassiemissy I dare TVB to throw cake and tea at Liza Wang because that will surely cause a media storm. But they don’t want to offend her so they pick on less influential artistes who won’t fight back. Shame on TVB. That was degrading and in very bad taste. I hope they didn’t ruin his clothes. Did he have a change of clothes handy? That wasn’t the story at all. How can an article get the story so very wrong? !